Players can activate this feature from their character window by clicking on 'Divine Beast' and then clicking activate. This will gift them a level 0 Divine Beast egg. The egg will then undergo 9 stages of growth, changing its appearance and boosting its attributes as players nurture it. The egg's stats will then be added to the player's character. 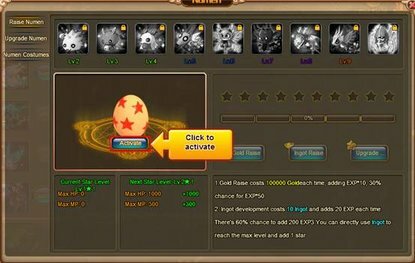 In order for the Divine Beast egg to reach the next stage of growth, it needs to gain 10 stars, this can be done so by paying gold or ingots. Once all 10 stars are filled, in order to proceed to the next stage players need to obtain souls via hunting, this can be done for free each day but additional attempts cost ingots. There is also a chance to fail the stage upgrade, which will result in losing the acquired soul. Players can choose to change the Divine Beasts avatar, and obtain additional ones in-game.